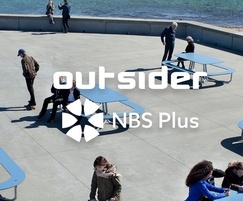 Artform Urban Furniture is pleased to announce that it has now included its out-sider range of products to the NBS specification software. NBS is used by specifier’s, landscape architects, urban designers and contractors as the leading source of quality product information within the construction industry, including for sourcing street furniture. More than 5,000 offices across the UK subscribe to NBS products, including 96 of the top 100 architectural practices. The NBS listing for Artform Urban Furniture now has 12 new products manufactured by its supply chain partner out-sider. This brings the total number of street furniture items listed on NBS Plus by Artform to 192. Representing a truly comprehensive collection of “high design” public realm furniture. This covers all aspects of site furniture, from innovative street and pathway lighting, to attractive planters and litter bins, as well as almost 70 unique outdoor seating designs. The extensive product ranges from each of these global leaders in outdoor furniture are only available in the UK via Artform Urban Furniture.